Since I alluded to my costume in a previous post, I figured I'd share since its science-related... A Big Ball of Pregnancy Hormones! If you look carefully, you can see the names of some of the common pregnancy hormones on the front of the shirt. (There's more on the back, too, but one pic is enough, thank you very much!) And, those are hormone-shaped spirals on my headband. How do seeds move from one place to another? 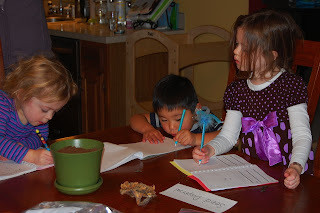 This is a follow-up to our seed collection activity from a few weeks ago. If you haven't done a seed collection, this could be done with seeds available commonly in your refrigerator or pantry. Also, as a note, this is a slightly more complicated activity and I imagine that it would work best with children that are slightly older - my five year old seemed to get it but I think it was a little tough for my little one. I had a great friend, Amy, and her son, Lucas, join us for this activity and, as she is the plant goddess I mentioned in an earlier post, she was incredibly helpful in brainstorming ideas for this activity. (She also has some great suggestions for books about seeds and exploring nature with children that I'll post at the very end.) What follows is an edited version of what we did including some improvements brainstormed by my mother-in-law, a retired elementary teacher, who is spending time with us this week. flower head or seed pod with a multitude of seeds on it - we used a dried sunflower head, but you could use many different types of flowers. If you don't have access to something like that, you could also use an apple, an orange or a handful of dried beans. 4 to 6 seed samples - try for a diversity of seeds that may use a variety of seed dispersal methods. Some of the ones we used were: maple seeds, pine cones, butterfly weed seed pods, acorns, blue false indigo seed pod, ornamental pear, crab apple, burdock, and dandelion seed heads. If you are working with more than one child, I recommend that you have sample bags containing each of the seeds available for each child to make thing move along more efficiently. Part 1: Why Do Seeds Disperse? Lucas extracting the sunflower seeds. Take the dried seed head and ask your child to see if they can find the seeds in it (you may need to help them). Demonstrate to them how to remove the seeds and then see if they can extract some seeds as well. Aim for about 10 seeds. 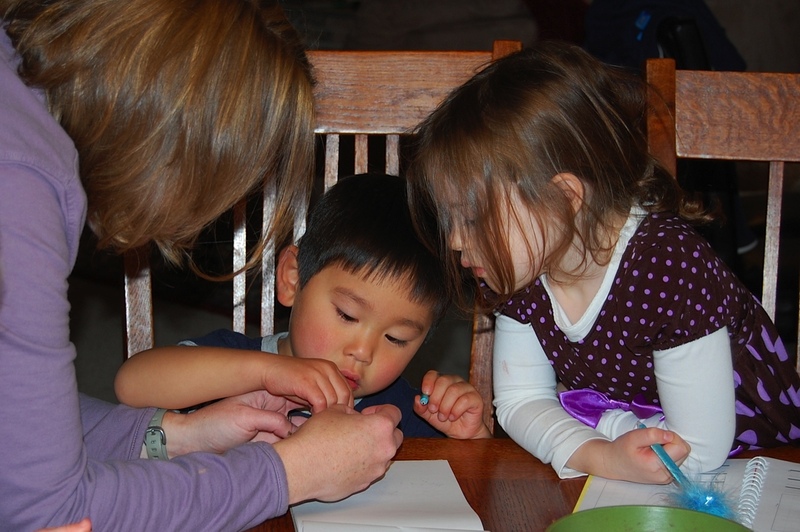 If you are using a science journal, you can give your child a few minutes to draw the seed into their journal. (They could also trace the seed!) If you don't have a seed head or pod from outside, you could also cut an apple or orange in half and harvest the seeds from it. The kids focusing on drawing their seed into their notebooks. Then, take your container of soil and tell them that you want to plant the seeds so that you can have some more sunflowers (or beans, etc.). Ask them to watch you carefully as you "plant" the seeds in the soil. Make one small hole in the soil with your fingertip and then put every single seed, one by one, into that same hole. Put on your acting personae and totally ham it up here; pretend to look into the hole to see if there is any more room, look worried, etc. Ask your child if they think the seeds will grow well or not and make sure they justify their answer. Discuss with your child what plants need in order to grow - make sure they think about water, sunlight, space, nutrients and temperature. (Note: the requirements for seed germination are different from plant growth - yup, I'm sure we'll be experimenting with that sometime in the near future.) Ask your child how you could plant the seeds differently so they might have a better chance of surviving? Talk about the fact that if all the seeds from a plant were to drop straight down in the same spot, then many baby plants wouldn't be able to survive. So, instead, many seeds are able to move to other places so they have a better chance of survival. But, how do seeds move? Here you can ask some silly questions, like, "Do seeds have a car?" For the next part of the activity, we will be talking about three different types of dispersal methods: wind, animal/human and water. Part 2: How Do Seeds Disperse? For each of the 4 to 6 seed samples collected, you are going to test whether you think they will be dispersed by wind, animal/human and/or water. 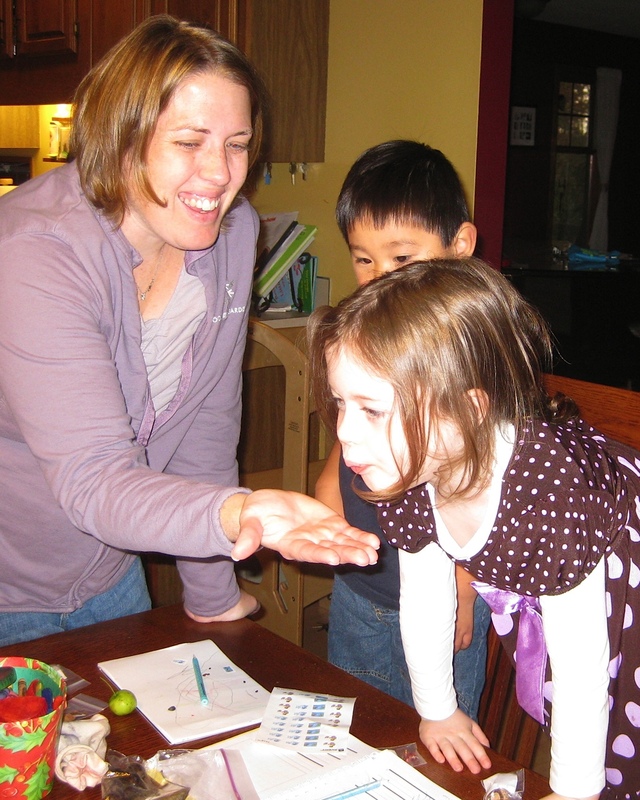 To test for wind dispersal, have your child place the seed onto your hand. Then have them blow onto the seed to mimic the wind and see if the seed will float through the air. If it does, have them place one of the "wind" stickers onto the specimen bag holding the other seeds, or write the word "wind" on the bag. They may want to hold the seed themselves to try to blow on it, which is great but try to encourage them to keep their hand steady so that it doesn't roll off. Observe how the seed moves through the air - if you have a variety of seeds then you should be able to see a few different types of movement through the air from the floating of dandelion seeds to the helicopter motion of maple seeds. Repeat the process for the rest of the seeds samples you have collected. Amy and Lucas examining a crab apple. There are a couple of things you can do to explore the connection between animals (including humans) and seed dispersal. The first is to take the piece of fabric and lay it on the table. 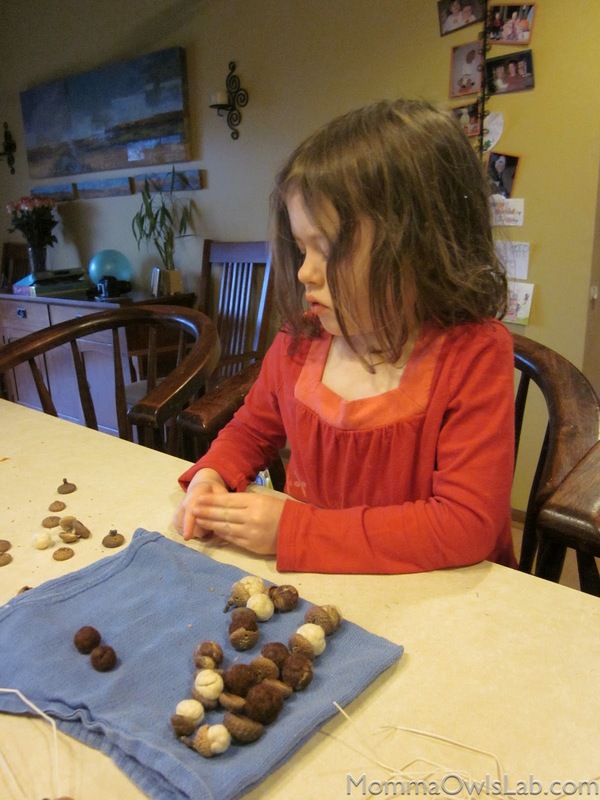 Ask your child to take the seed and gently throw it onto the fabric. Pick up the fabric from one side and observe whether the seed "sticks" to the fabric or rolls off. If it sticks to the fabric, like a burdock seed might, then animals might be responsible for its dispersal. The second thing you can do is examine the seeds and have a conversation with your child in regards to whether they've ever seen an animal eating that type of seed. Squirrels and acorns are a commonly associated pair, but you could also talk about horses and apples or birds and berries. Some children may also like talking about the idea of animals helping to provide the seed with a built-in fertilizer after the seed goes through the animal's digestive system! Put "animal/human" stickers onto the specimen bags that contain seeds that might be dispersed in this manner. Note that at this point, some seeds may have tested positive for both wind and animal/human dispersal and will have two stickers; that is totally fine! Testing for water dispersal: sink or swim and rain simulation. Water is maybe the trickiest to test of these three seed dispersal methods. One thing you can do is to test to see if the seed floats in water. Note that this isn't necessarily the most accurate method as some seeds, like acorns, only float when they are no longer viable. (So, if you want to grow an oak tree, dump a handful of acorns in water and only use the ones that sink!) But, as we're really working on the process of science here, the floating technique is a decent test. Another idea that Amy had is to place the seed on a pan or plate in the sink and then turn on the water and use the sprayer to see if they can spray the seed across the pan or plate. Make sure that the water flow is at a fairly low pressure so that the force is reasonably similar to rain. At higher pressures, you can talk about how maybe that represents a seed falling into a river while at lower pressures it is more like rain run-off. 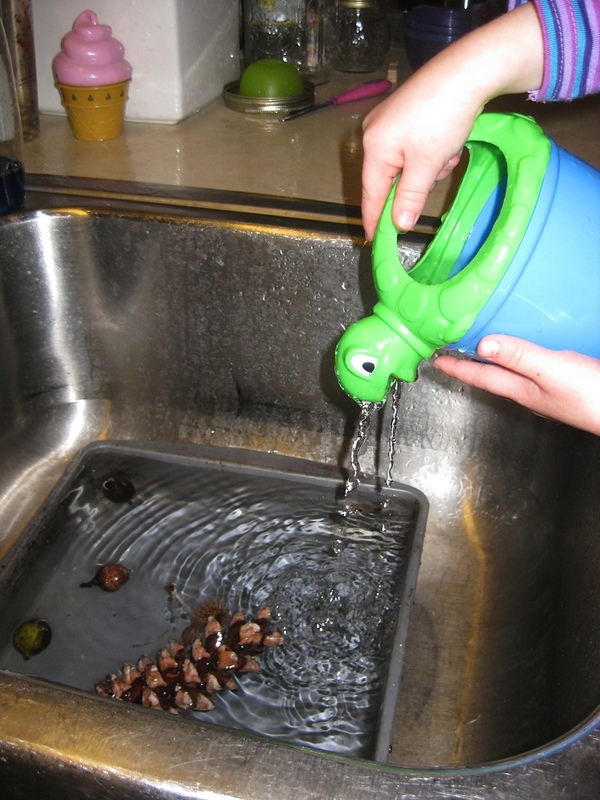 If you don't have a sprayer as part of your sink, you could also use a small watering can. Again, repeat for each of the seed samples and then mark each bag. Many plants utilize seed dispersal methods so that their seeds, their "offspring" have a better chance of survival. In general, seeds need both appropriate temperature and moisture in order to germinate. Seedlings, or young plants, need those two things as well as sunlight, nutrients and appropriate space. We explored wind, animals/humans and water as three common dispersal methods. In addition, both gravity and force are often cited methods but we skipped over them to simplify the activity. The thought of explaining the concept of gravity to my preschoolers was a little daunting to me - not to mention the fact that everything is subject to gravity (thank you, Mr. Newton) so we wouldn't really be distinguishing our samples. As an example of force dispersal, think of touch-me-not or jewel weed flowers whose ripe seed pod bursts open to spread their seeds. If you tested all three dispersal methods, you probably found that some of you seed samples tested positively for more than one method. This roughly approximates nature as some seeds may have a dominant method of dispersal whereas others may disperse by multiple means. An example is the apple, which is a very commonly dispersed as animals eat it and then take the seeds to new locations. However, an apple is also able to float (think: bobbing for apples) and is also capable of being moved by water. For older kids: As I mentioned earlier, this activity is probably more suited to older kids (early elementary) that the really young ones. 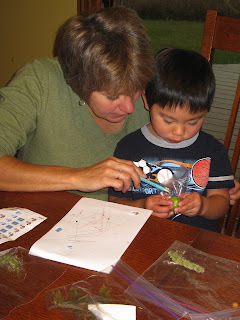 For slightly older kids, you can increase the number of samples, have them make a data table that shows their results and incorporate measurement into some of the tests (i.e., measure how far they can blow different seeds). Books: We found a couple of books at the library that were great supplemental material for this activity. The first is Eric Carle's "The Tiny Seed", about a tiny seed that is blown from a flower in autumn and all the challenges that it must face to grow into a seed-producing flower. We also enjoyed "Flip, Float, Fly: Seeds on the Move" by JoAnn Early Macken, which gave lots of examples of movements by different seeds. Amy recommends, "A Seed is Sleepy" by Diann Hutts Aston and Sylvia Long, which contains absolutely beautiful illustrations! 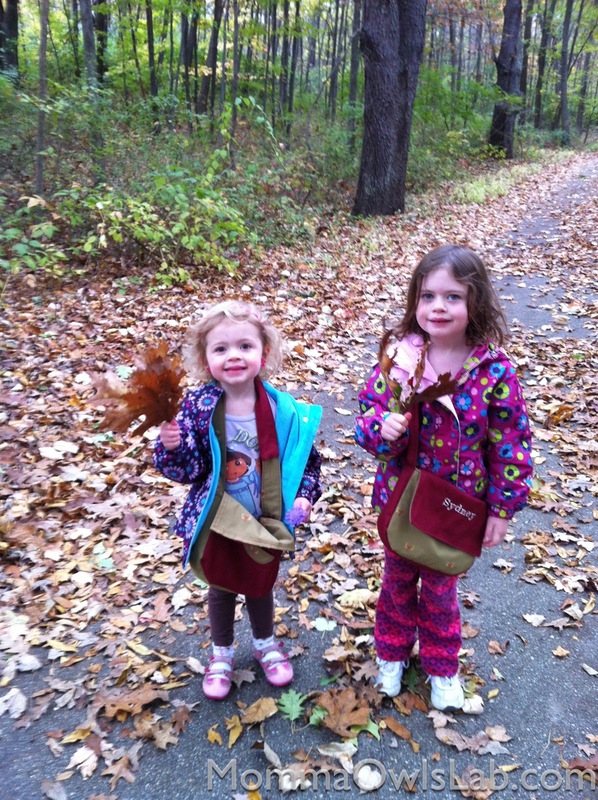 Exploring Nature with Kids: Amy also recommends a couple of other books that are great for teaching kids about nature. 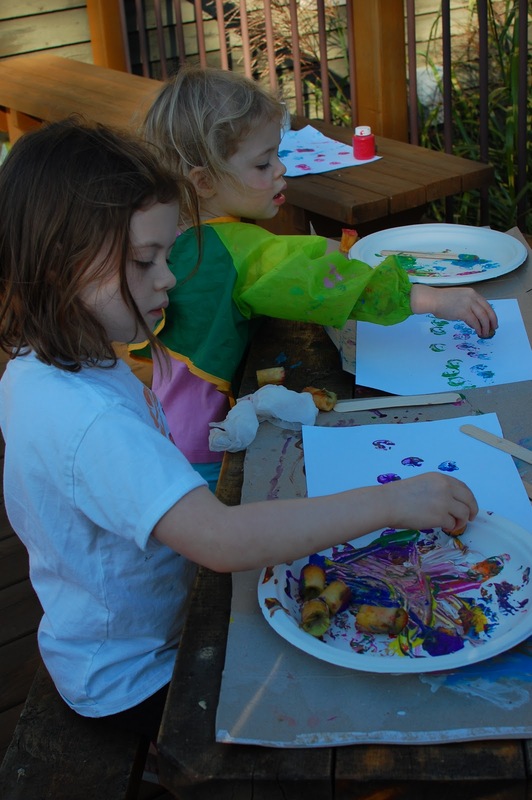 They include: "Sharing Nature with Children" by Joseph Cornell, "Sunflower Houses: Inspiration from the Garden" by Sharon Lovejoy and "Hands-On Nature: Information and Activities for Exploring the Environment with Children" by Jenepher Lingelbach. I warned you that I'm slightly crazy about Halloween (just wait until I share my costume for this year!) so the Halloween-themed activities continue... This week we're working on making slime. Traditionally, and with older kids, I've made slime with the classic combination of Elmer's glue and Borax. However, because of the ages of my girls, I decided to seek out some alternative recipes for a safer, "edible" (but not necessarily tasty) slime. I couldn't decided between a couple of recipes, so we're going to have a "Slime-Off" and each girl will make one of them and then we'll compare them to declare a slime winner. After making both several times, I think Slime 1 is the more child-friendly slime to make and has a truer "slime-feel" to it. To start, add the soluble fiber to 1 cup of water in the container. Add 2-3 drops of food coloring - it will get darker as it cooks so don't go overboard on the food coloring. Secure the top and have your child shake the container for about one minutes. Pour the mixture into the microwave-safe bowl and cook in the microwave on high for 1-4 minutes, or until the mixture starts to boil. When it starts to bubble vigorously, stop the microwave and stir the mixture. Cook for another 1-2 more minutes and then stir again. Repeat 3 to 4 times. You will know when you are getting close when you stir the mixture and lift up the spoon and the slime makes a thick tendril leading all the way back down to the bowl, as shown in the picture. Once you get to that stage, you can stop there if you want a more liquid slime or cook for another 1-2 minutes if you want a stiffer slime. Spread the slime into a large bowl to cool - be careful because it will be very hot! This slime is a little more difficult both because it requires the use of a stove top, which makes it difficult for young children to be involved, and also takes more time. To make this version, stir together the cornstarch and the sweetened condensed milk in the small saucepan. Place over low heat. The mixture will become thinner as it heats and then start to thicken. It took us about 20-30 minutes, but it depends on the relative heat of your burner and the type of pan that you use. I noticed that the mixture next to the sides of the pan started thickening first. You can take it off at that point to have a thinner slime or cook it a little longer to thicken it up a bit more. I left one batch on for about 10 more minutes and it became the consistency of a very thick butter cream frosting - not very slimy in my opinion! Spread the slime onto a large plate to cool - be careful because it will be very hot! Now the fun part! 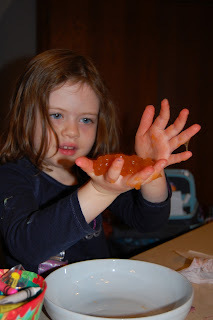 Give your child a sample of both of the slimes and let them play with them for a bit. It is helpful at this point to have a big bowl of soapy water and a hand towel easily acceptable for them to clean themselves up. 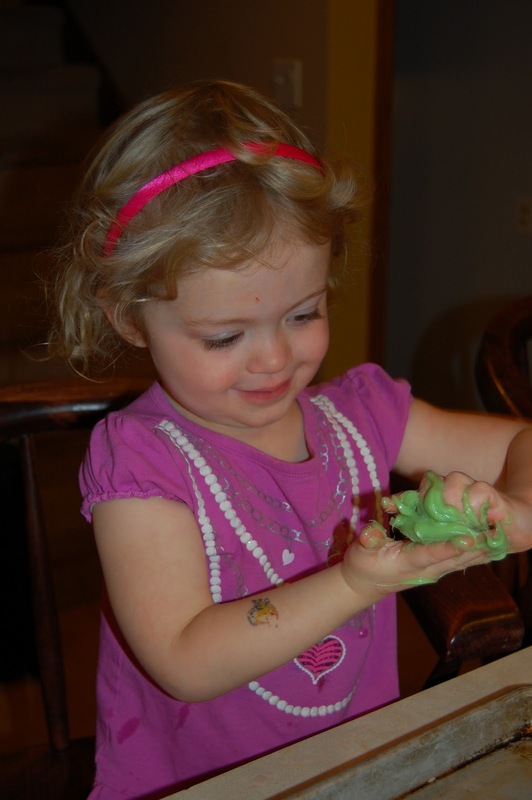 Maya playing with the condensed milk-based slime. Sydney playing with the fiber-based slime. Once they are finished, have them draw a picture of the slimes in their science journals as well as observations about each of the slimes that they made. Finally, ask the child to assess which recipe made the "better" slime in their opinion and have them justify their answer. The both liked the fiber-based slime better - they described it as "cold", "like jello", and "slimy". The condensed milk based-slime was "squishy", "oozy" and "gross". Maya tasting the condensed milk-based slime. Her response? "Yuck!" Influenced by her sister, this was Sydney's reaction to being asked if she wanted to taste the slime. Make sure to dispose of the slime in the trash as it can wreak havoc on pipes! Slimes are a great examples of a class of molecules called polymers. Polymers are long chains of molecules that are often cross-linked together to form a unique substance. The resulting substance often displays the characteristics of a non-newtonian fluid, like we discussed earlier with the oobleck experiment in that the viscosity changes depending on how much force is applied. The substances are also often very stretchy because the cross-linking acts as miniature springs holding the long chains together. Polymers are found both in nature and are man-made. Common examples of polymers are rubber, nylon, bone, plastics, styrofoam, silk and, my favorite, Silly Putty! If you want a much more in depth (complete with chemical structure drawings!) explanation of what is happening with slime, check out this site. 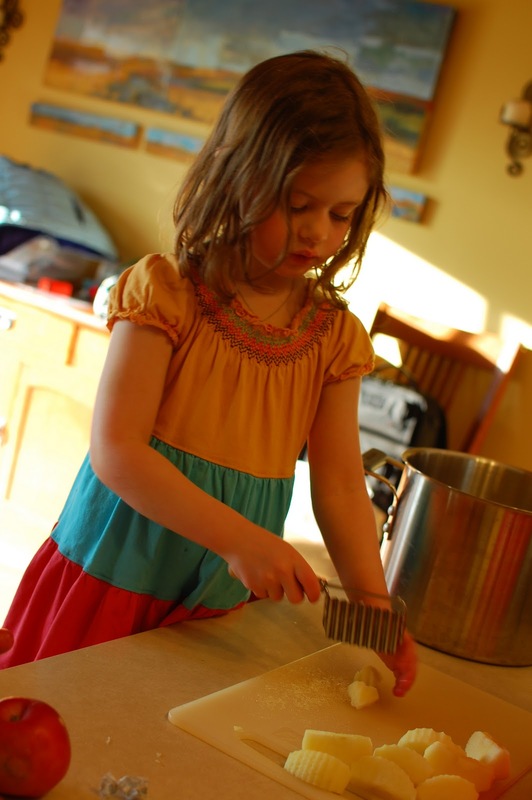 Play with quantities of ingredients and cooking time. You can also substitute ingredients - we ended up using a sugar-free Metamucil left over from my first pregnancy five years ago. I am very curious about what would have happened with a regular version of it. I also feel like gelatin should work, but haven't tried that yet. Please let me know if you do try it or find a recipe! There are also a huge variety of slime recipes collected at About.com, many of the edible versions have variations on the types that we made. For example, chocolate slime can be made by following the directions to Slime 2, but adding 2 tablespoons of chocolate syrup and increasing the cornstarch to 1 1/2 tablespoons. Apparently, you can also substitute tonic water in the recipe for Slime 1 and the end product will be a slime that glows under black light due to the quinine in the tonic water. In the topic of polymers, there are many other polymer-type recipes on the web. This site has a huge variety of them to check out. You can also make a slime out of milk protein - check out directions here! 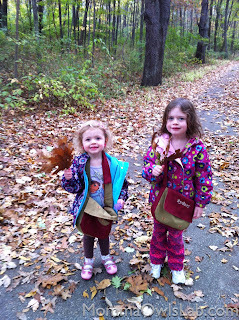 The driveway leading to our house is surrounded by oak trees and the girls and I love walking down it during the fall, crunching the leaves under our feet and finding treasures to bring back to our nature table. 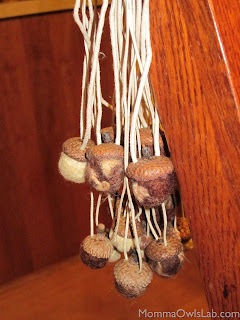 Recently, I saw a very cool post on Rhythm of the Home about using acorn caps and felted wool balls to make acorn necklaces. Perfect! to finally assembling the acorn necklaces - and Sydney even got to wield the glue gun. Yes, a little scary (for mom) but she was so proud of herself! 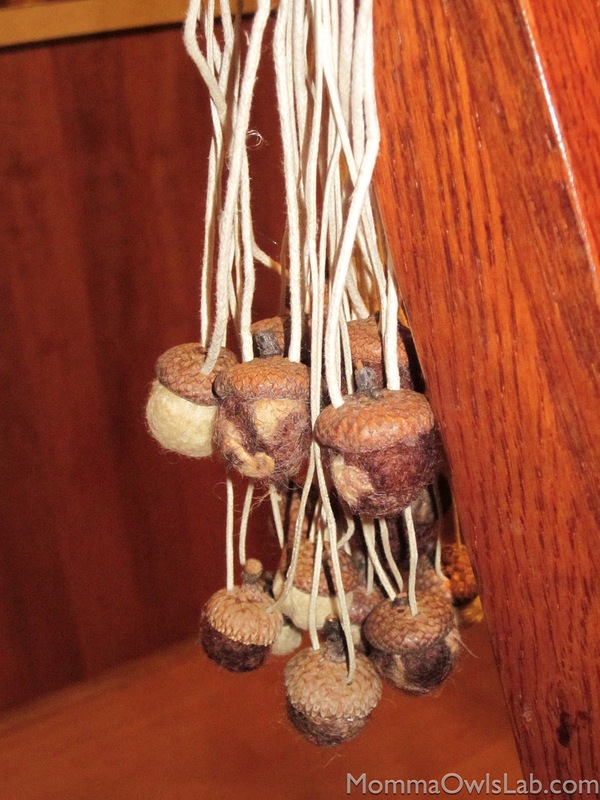 We used two small packages of wool roving (one cream and one dark brown) and it made about 20 acorn bottoms. I found that the girls could roll it most of the way into balls, but needed a little help at the end to finish them off. As Syd's 5th birthday is coming up, I think we'll bring our finished product to school that day to share with her friends. In case your curious little scientist asks, I wanted to add a brief explanation of why the wool roving felts into balls. Wool is a natural fiber whose shaft has an interesting characteristic in that it has what amount to little hooks coming off of it. Given the right circumstances, in our case: water, soap and friction, the hooks are able to grab onto each other and create almost a matted fabric. (Hence the problem with throwing a 100% wool sweater in the washing machine... massive shrinkage!) The wool from different breeds of sheep may felt differently from others. Also, many white or even cream wools do not felt well. This is because in order to create the white color, many of these wools are bleached which destroys that hook-like characteristic of the shaft so it is no longer able to grab onto other wool. We definitely found that to be true in the acorns that we made - the white ones were much harder to form into felted balls than the brown roving! Originally, we were going to do an activity with seed dispersal this week, but we're going to table that until next week and work on a skeleton activity instead. We are going to keep our seed samples in a gallon size plastic bag in the fridge (to prevent mold) and next week we will be joined by my friend, plant goddess extraordinaire, Amy, and her son. In the meantime, let's delve into skeletons! I probably should have started this out by saying that I love Halloween. Seriously love it. And I think its a genetic trait passed on from my mother. For the last 10 years or so she lived out in the country and received maybe 10 trick-or-treaters total in all that time but that didn't stop her from coming up with wonderful, zany and original costumes each year. We also are currently living out in the country and count a grand total of zero Halloween night visitors over the last 7 years, not that it has stopped me either. The genesis of this activity idea occurred earlier this week while I was wandering the Halloween aisle at Target, looking for a giant spider for our faux web. (Incidentally, I found one and love it, but the girls are not so thrilled by it...) In my browsing, I kept noticing example after example of skeletons, some more accurate than others and it got me thinking about both skeletons and anatomical models. In this activity, we will compare several skeleton models and identify which model we think is most accurate and in the process talk about both the role of the skeleton and how models are useful. It will also utilize math skills (counting) so the activity itself may be better suited to children that have a better grasp of numbers but younger kids can get the gist of the idea and there are many extension ideas that would definitely work with the younger set. We had a lovely weekend in West Michigan with gorgeous sun all weekend - such a needed contrast from the previous gloomy week! With some friends, we took the girls apple picking at a nearby orchard. Like, really nearby. We could have walked there. How awesome is that? It's only a few years old and this year was the first, at least to my knowledge, that the option to U-pick was available. We picked both Golden Delicious and Jonagolds and grabbed a 1/2 bushel of Honey Crisp seconds. I put the girls to work peeling and helping to cut the apples, and together we made 16 pints of applesauce and 7 half-pints of apple butter. We followed the sauce recipe closely, except for substituting apple cider for the water in the applesauce and throwing in a cinnamon stick. The girls also enjoyed seeing the star shape made by the seeds in the apple core when it is cut cross-wise. So, while our last pots of applesauce were bubbling on the stove, we cut all the remaining cores in half and used them with some paint for a stamping activity. The girls had a great time with it. Sydney made one that looked so much like pansies that I suggested that she paint on some green stems - it came out so well that it will probably become a holiday present for my father, who loves them. 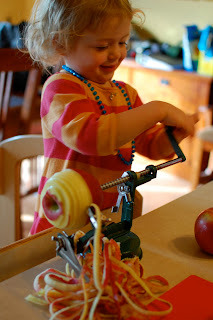 As a side benefit, all the work with apples and seeds will lead nicely into our Science Thursday activity this week.